The Electoral Commission has printed out copies of the National Register of Voters recorded as at April 19, 2017, for registered political parties. 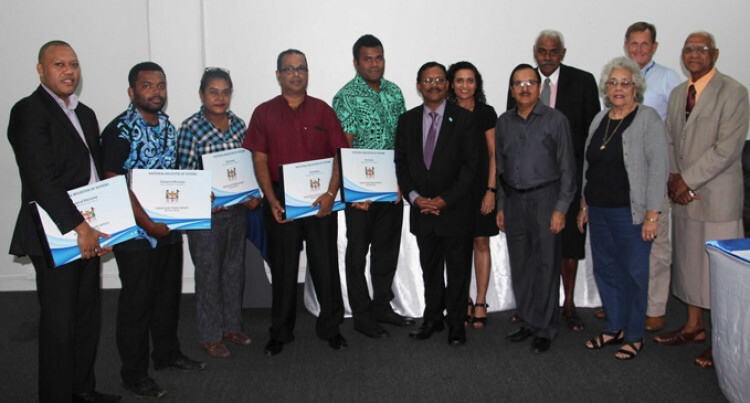 In a Fijian Elections Office press release yesterday, the chairperson of the Electoral Commission, Suresh Chandra yesterday presented the listings to representatives from the Fiji United Freedom Party, FijiFirst Party, Fiji Labour Party, National Federation Party and Social Democratic Liberal Party. “We have given five Registered Political Parties a copy of the complete set of the National Register of Voters free of charge in order to help them prepare accordingly for the 2018 General Election,” Mr Chandra said. The Electoral Commission yesterday also approved the rules governing objections and appeals to registration on the National Register of Voters. Currently, there are no provisions where a person can lodge a complaint against a registration. The rules will create this process and allow for natural justice principles to be exercised during the adjudication process. An appeals process has also been established to allow the Electoral Commission to finalise the verification of a voter. The Fijian Elections Office [FEO] will print forms for the Objection and Appeals which will be widely circulated and uploaded to the FEO website. The FEO will also maintain a register of Objections and Appeals to allow for proper record keeping.